Lawrence S. Bacow, a career educator, is schooled in making decisions. 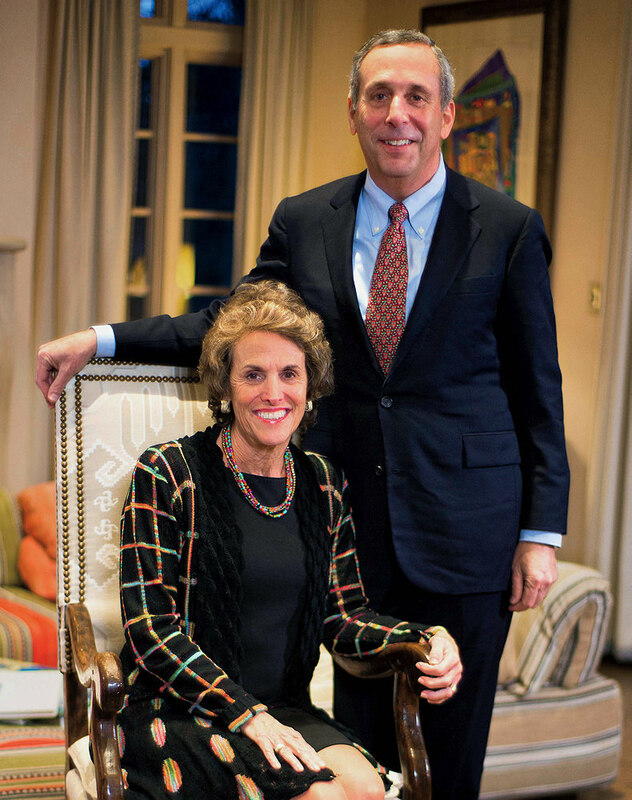 Lawrence S. Bacow and Adele Fleet Bacow, shortly before the February 11 announcement that he would become president. You don’t have to solve every problem in the university on day one, or even in the first year. You need to understand the culture, understand the organization, understand the students, the faculty, the staff, the alumni. Figure out what needs to be done, and then do it. In the context, that last bit might seem a riff on Nike’s slogan. But Bacow’s seemingly simple formula assumes broad significance given his lifelong immersion in higher education: from MIT undergraduate (’72, economics) to three Harvard degrees (M.P.P.-J.D. ’76, Ph.D. ’78); 24 years on MIT’s faculty and leadership positions there; the Tufts presidency; and (penultimately, it turned out), beginning in 2011, higher-education advising and consulting, and Harvard Corporation service. A scholar of decision- and policymaking in complex settings, Bacow combines deep understanding of how diverse interests are expressed and aligned and more than two decades of experience in applying those insights to set agendas, mobilize support, and effect decisions in the unwieldy, multicentric, hothouse setting of elite universities. In other words, as he explained in a recent conversation, he brought to his new role as Harvard’s twenty-ninth president, on July 1, a clearly expressed, readily understood theory of action. As abstract as that might seem, the man himself speaks in a comfortably conversational style. Although he uses engineering and social-science terms fluidly, and resorts to sports metaphors (from running and sailing, a lifelong passion), his voice is distinctively personal, drawing examples from boyhood experiences; formative teachers and mentors; and deep and apparent religious faith. The effect is clarity about leaderly matters ranging from articulating strategy to defending free speech within the academy. In the event, Bacow emerged properly equipped. His dissertation, “Regulating Occupational Hazards through Collective Bargaining,” assessed the Occupational Safety and Health Act (OSHA, legislated in 1970) from the perspectives of policy (finding no statistically significant evidence that accidents had been reduced); law (revealing an often adversarial standard-setting process, ill-suited to the distinctions among myriad workplaces and unlikely to yield either a commitment to implement the standards or a search for more practical options); and economics (the inefficiencies and excess costs baked into the system). He found that although OSHA’s rulemaking “provides a convenient forum for the presentation of alternative viewpoints, it is not well structured to resolve the differences”—a very unlawyerly notion. The parties faced no pressure to reach agreement, nor any cost for failing to do so: a formula for future litigation—but not for improving actual workplaces cost-effectively. He also enumerated the imperfections in a wholly market-based approach to job safety and health, given limited knowledge and other constraints. At Harvard, then: the young couple in 1976, when Larry Bacow became a newly minted M.P.P.-J.D. In this light, his dissertation’s academic, anodyne title—mashing up “regulating” and its command-and-control connotations with the very distinct processes of “collective bargaining”—could also be read as a statement of how to think differently. Aiming toward safer workplaces, it cut through problems of cost, insufficient and unequal expertise, and even the philosophical divides that separate advocates of risk-based, free-market solutions from those who see a rights-based role for government intervention. Degree in hand, Bacow headed back down the Charles for a two-year faculty appointment in MIT’s department of urban studies and planning—a trajectory that pointed decisively back into academia, in a field where he could draw on those disciplines to engage with interesting policy problems. Academics have a general tendency to look for global solutions to interesting policy problems. In fact, much of the academic debate over regulatory reform centers on the choice between standards and economic incentives. Although the participants in this debate have produced much interesting literature, the debate itself has been over the wrong question. Economic incentives can no more be preferred to standards than a wrench can be preferred to a pair of pliers—there is a time and a place for each, and what is important is knowing when to use which. To do a good job, the regulator needs to know how to match regulatory tools to regulatory problems. As a scholar-teacher, Bacow embedded himself more deeply in policy thickets even more complex than negotiating workplace safety: resolving environmental disputes (siting, permitting, rulemaking, and enforcement). Here, disparate actors expressed differing values, assessments of risk, and guesstimates of probable outcomes—all in the context of overlapping laws and regulations at multiple layers of government. From an MIT research project, Bacow and Michael Wheeler, then of the New England School of Law and MIT, created a graduate-level casebook, Environmental Dispute Resolution (1984). Their friendship since the early 1980s has led Wheeler to put the conclusions they drew then into broader context. He and Bacow, he said, share the view that conflict “can be very costly in lots of ways, but it can also be generative—can be the basis for more solutions” than those surfaced otherwise. Bacow’s higher-education leadership roles, he continued, have been informed by “the same view of accepting the reality of conflict, of understanding that it must be charged and dealt with, that if it were stifled, we might be the worse for it.” Conflict, in other words, can advance a mission—so long as it evolves and does not devolve. Hence the importance, for leaders, of understanding all the parties to an issue and analyzing their perspectives: the take-away Bacow summarized for his Crimson running partner in April. In the doing, “I loved being faculty chair. I thought it was a wonderful job.” Faculty members, he realized, “tend to keep our noses down. We know the people who live in our neighborhoods…intellectually and geographically.” But as chair, “you have the world’s biggest hunting license,” addressing everything from the way MIT brought junior faculty members aboard to concerns about student life and learning. Interestingly, MIT had seriatim committees on the latter; this time, Bacow and colleagues “[took] a look at why those other committees had failed” so their new task force could actually get things done. As chair, for a transition year and then a two-year term, Bacow attended MIT Corporation meetings—and had the idea of inviting members to come a few hours early to meet with groups of professors to learn in depth how they spent their time: an education in academic life for the governing board. He also joined weekly two-hour Academic Council sessions, convened by the president and including deans, the provost, the head of the libraries, and others: a personal education in the institution as a whole, including access to all tenure and promotion cases. The professor of planning was quickly exposed to all the disciplines, to admissions and financial aid, and to federal education policy—at a time when MIT was cutting its costs to adapt to more stringent reimbursement for the overhead on research grants. From this lapse into administration, Bacow returned to his faculty duties for a year, setting up a center to coordinate MIT’s environmental initiatives. But the hook had been set: in 1998, MIT president Charles Vest appointed a new provost, Robert A. Brown, who had been engineering dean when Bacow was faculty chair. Vest also created a new post, the chancellorship, and appointed Bacow. He and Brown sorted out their respective responsibilities—in Bacow’s telling, over bagels at the S & S Deli in Inman Square. MIT’s deans reported to Brown, who ran the budget; Bacow oversaw everything that cut across the schools, from undergraduate and graduate education to strategic planning, allocation of space, and institute-wide partnerships with other institutions. He also engaged with audiences ranging from alumni to visiting world leaders. Those formal responsibilities completed the leaderly preparation of two presidents-to-be (Brown now leads Boston University). In Bacow’s case, other lessons accrued, too. In the wake of the 1997 death from alcohol poisoning of MIT freshman Scott Krueger while pledging a fraternity, the chancellor took on the challenge of moving toward on-campus housing for all freshmen, upending a cherished tradition. Effecting that change was not easy (“I was hung in effigy,” he said in the 2008 interview). “It was a very stable system, and one which people clung to”—an example of the organizational culture he had observed at OSHA. The Krueger death seems to have shaped the way he later talked to Tufts students and parents about drinking. Those cumulative experiences likely entered into his thinking about Harvard’s decision to sanction undergraduate membership in final clubs, fraternities, and sororities: a policy he and fellow Corporation members affirmed in a vote late last year, during the presidential search. His beginning-of-year letters shared news of appointments, praise for colleagues who had received honors, and updates on capital improvements and academic programs. Other emails were straightforward about personal matters of institutional import, such as the infection of the heart lining that left him “a guest” of the Tufts-affiliated hospital in the spring of 2004. Tufts is small—like an urban Dartmouth—with faculties of arts and sciences, and of engineering; dental, medical, nutrition, and veterinary schools (in Boston and Grafton, respectively); and the Fletcher School (international affairs). The compact central campus, in Medford and Somerville, invites that kind of personal outreach—augmented by the president’s morning runs, and such innovations as the Bacows’ dinners at their home for all members of each senior class. The scale also enabled him to talk to people throughout the institution, and to aggregate and process what he heard and saw. In the assessment of Sol Gittleman, the provost for 21 years, who stepped down shortly after Bacow arrived, Tufts in 2001 was a school that had from inception been a superb undergraduate teaching institution, onto which a research culture had begun to be grafted in recent decades. “The faculty just fell for him,” Gittleman, now retired, said in a recent conversation, embracing their new leader as a fellow scholar and appointing him to their ranks in five separate departments in three separate schools—recognition not bestowed on his two immediate predecessors. By the end of October, Bacow was ready to suggest where Tufts needed to progress, appointing a task force to examine the undergraduate experience, and a university council on graduate education (through which research priorities and cross-school opportunities would be identified). He also eliminated a vice presidency (for arts, sciences, and engineering) and the associated budget, and applied the savings to faculty salaries: a modest but tangible signal about the research mission. As Gittleman announced his plan to return to teaching, Bacow hailed him as a “wonderful mentor” and “a true mensch”—apt for a professor of Yiddish literature. “People comfortable dealing with ambiguity. “People willing to take a risk to make a difference. “People more interested in solving problems than in taking credit. “People who—Mrs. Chandler will be glad to hear—can appreciate what others have to say. Who are both effective advocates—and aggressive listeners. He then proceeded, bracingly, to assess strengths and weaknesses, in a way rare on contemporary campuses. Thus, Tufts provides “a nurturing environment for our students”—but some “graduate programs are anything but nurturing.” As the “smallest of the major research universities,” Tufts had undersold its life-sciences prowess. Its professional schools charged among the highest tuitions in the country (a problem that required more resources). The resulting strategy was not sugarcoated. There were appealing goals: the faculty embraced better salaries and hiring packages, and the related investment in laboratories and research facilities. Turning from the teachers to their students, Bacow said Tufts had to commit to need-blind undergraduate admissions—for which it would have to raise nearly four times as much scholarship endowment as it had realized in the campaign that concluded the year before. But Bacow also emphasized accommodations that had to be made. Given scarce money, space, and faculty slots, their use would be driven strictly by academic priorities, enforced by a budget run from the provost’s office (a departure for Tufts, meant to send “important messages about how we are changing the way we do business”). Even closer to home, “true excellence will test Tufts’ egalitarian culture.” In a tight market for faculty talent, “we are going to have to match employment offers from other very competitive institutions”—hiring a young colleague as a full professor lest she or he spurn an offer at a lower rank, or promoting colleagues more rapidly than usual to retain them. And ahead of the coming campaign, Bacow even settled on “slowing growth in the deferred maintenance budget” to free resources to invest in the people priorities. His peroration hit the standard notes—“We must raise our sights for the faculty we hire, for the students we recruit, for the donors we solicit, and for ourselves as a board”—but it was built on a distinctive foundation of candor and tough love. Such discussions may have taken place at Harvard in recent decades, but not for public consumption. In the event, Tufts met his goals. Despite severe headwinds from the financial crisis, the campaign exceeded its $1.2-billion target in the final week of Bacow’s presidency, in June 2011, raising $434 million for financial aid and $386 million for new faculty positions and research support. The rallying to the cause no doubt reflected enthusiasm for his strategy. • Weathering the storm. It probably also reflected confidence in how he had navigated that crisis. (From 9/11 to 2008, Gittleman said, Bacow was “never lucky” as president.) A series of community memos, beginning October 6, 2008, openly acknowledged conditions “unlike any I have ever witnessed in the financial markets,” but asserted, “Tufts has never been in a stronger financial position,” with a growing endowment, modest debt, and an improved credit rating. From the outset, Bacow stressed, “We have a moral obligation to continue to meet the full need of all undergraduates currently enrolled at Tufts, and we will do so.” He even indulged in humor (“Economists are fond of giving forecasts without time horizons. I can guarantee you that this market will turn, but I cannot tell you when”), reinforcing readers’ sense of their leader’s assurance. • Giving voice to values. Support for Bacow as a strategic and fiduciary leader was surely buttressed by his comparable addressing of academic values—and community members’ obligations—on divisive issues such as free speech, norms of appropriate behavior, and, more generally, how to conduct one’s life. -Speech. When issues of offensive, hateful speech arose on campus, Bacow responded with an unwavering, three-part response: an absolute affirmation of freedom of expression; application of that freedom to condemn what he saw as false or abhorrent speech; and an appeal to individual reflection and common values. Our embrace of freedom of expression sometimes…means we must live with gross distortions of fact, caustic commentary, boorishness, sophomoric behavior, and even personal attacks. To say that we must live with this behavior does not mean, however, that we have to condone it.…I condemn the personal attacks that have become commonplace…. -Campus behavior. Bacow has held students accountable to high standards in other, unusual ways. Let me give you some blunt advice about drinking. Nothing good ever happened to anyone while they were drunk. You are likely to embarrass yourself or worse, put yourself or others at risk.…Please be advised that Tufts is not a consequence-free zone. Your Tufts ID does not entitle you to flout the law…. We expect you to be the type of person you described in your application.…[N]one of you claimed to be loud, obnoxious, drunk, or offensive to your neighbors. We don’t expect you to behave that way here either. How better to proceed? By “trying to find the teachable moment,” teasing out divestment from South Africa (which Tufts supported) from comparable sanctions on Israel. His basic conclusions were that proponents of divestiture are not anti-Semites and that “the conversation comes to an immediate and crushing end if you label them as anti-Semites. This language is not helpful”—foreclosing reasoned efforts to change opinions. A consequential decade: boosting financial aid and faculty prowess, in a presidency Tufts "needed"
-Lives well lived. The tendency of elders to bestow wisdom on their young charges is particularly pronounced on ritual college occasions. Doing so originally is a test of oratorical skill, which in turn reveals the emotional intelligence, at least, of the person commanding the lectern. There are lots of ways to earn a living. What is truly important is to lead a meaningful life, to acquire a good name, or as the Talmud would say, a shem tov. We have every confidence that you will make your mark in the world, and that you will create for yourself a shem tov, a good name. At the conclusion of his presidency—a decade in which he had made decisions that necessarily disappointed some people, and routinely called out those who he felt had fallen short of community standards (and their own)—Bacow departed, Sol Gittleman said, as someone who had begun with a “pretty good product and made it much better, in every respect.” He was “clear, transparent, and honest, but he made decisions.” Tufts “needed that presidency,” he continued, and Bacow is remembered as someone who “just had it.” He departed with his shem tov intact. After Tufts, the Bacows appeared headed for a more relaxed pace—but not retirement. Adele Fleet Bacow continued her planning, cultural and economic development, and urban design practice as president of Community Partners Consultants, the firm she founded in 1996. Larry Bacow was president-in-residence and then leader-in-residence, respectively, at the Graduate School of Education and the Harvard Kennedy School—and, from its expansion in 2011, a fellow of the Harvard Corporation. The couple spent time with their two sons’ growing families in New York, and acquired a second home on Florida’s Gulf Coast, a better base from which to indulge in sailing during New England winters. With the gift of less structured time, Bacow pursued several issues in higher education that could become pertinent, in ways then unforeseen, given the decision he made this past winter to move across campus to Mass Hall. In a 2015 academic paper, “Online Higher Education: Beyond the Hype Cycle,” Michael S. McPherson, president of the Spencer Foundation (which funds education research) and past president of Macalester College, and Bacow warned that the adoption of online education could worsen inequalities in higher education. That “dystopian” outcome might result if state legislators used online learning as an excuse to cut appropriations to public institutions, while elite private ones “flipped” more courses and invested even more heavily in smaller, faculty-led classes. • Bolstering public universities. Bacow served as an adviser to the American Academy of Arts & Sciences’ Lincoln Project: Excellence and Access in Public Higher Education. Its report, published in 2016, observed that following the Great Recession, hard-pressed states cut support for public universities severely. Many institutions were forced to curtail programs and to increase tuition sharply. Because they educate nearly four million students and disproportionately enroll those with the greatest financial needs, their very character as “public” institutions has come under threat, and their expansive research is in jeopardy. The Lincoln Project pragmatically observed that the budget cuts were “not necessarily the result of changes in political philosophy” but rather reflected “long-term structural changes in state finances.” In response, it recommended renewed state support, coupled with internal cost efficiencies and new revenues; public-private partnerships to sustain research and teaching; and further efforts to help students through simplified financial aid and clearer transfer processes. The presence of private representatives (Bacow; former Columbia provost Jonathan R. Cole; and Shirley M. Tilghman, president emerita of Princeton, and from January 2016 a fellow member of the Harvard Corporation) strengthened the case for their public peers. • Networking in higher education. Bacow is deeply embedded in the higher-education community along Boston’s Red Line subway (from MIT to Harvard to MIT to Tufts to Harvard). At Tufts, he broadened that circle, serving as chair of the council of presidents of the Association of Governing Boards of Universities and Colleges and a member of the executive committee of the American Council on Education’s board of directors. But the online-learning studies and Lincoln Project expanded these ties. The 2012 online-learning research spanned the spectrum from Bryn Mawr, MIT, and the University of Texas to Austin Community College, Fayetteville Technical Community College, and Morgan State University—including schools with negligible resources that are intimately involved in educating students who must overcome huge socioeconomic challenges. Similarly, former Berkeley chancellor Robert J. Birgeneau (whom Bacow knew from MIT) and Mary Sue Coleman, then president of the University of Michigan (now president of the Association of American Universities), led the Lincoln Project. Other advisers came from the across the country, from the University of Arizona to West Virginia University. If he wants to build a higher-education coalition, Bacow can engage with a refreshed contact list extending to every kind of school—and to congressional districts not routinely on the Harvard fundraising circuit. [C]ompetition…in most other industries has the effect of driving costs down.…In higher education, in some instances, competition has the effect of driving costs up. Students and their parents are looking for smaller class sizes, not larger classes. They are looking for more student/faculty contact, not less. They are interested in more hands-on learning, not in rote lessons delivered in a lecture hall….I think these trends produce an educational output that is unique and outstanding, but it is an educational output that is also expensive. In other words, the negotiation scholar sees that lower costs are feasible—but lack a constituency. And the competitive dynamics suggest that online pedagogy—the first good opportunity to raise teaching productivity in a century—might be deployed in the richest institutions, in McPherson and Bacow’s analysis, only when they “can demonstrate that it is actually more expensive than existing methods.” Most bluntly, “selective institutions…actually compete to be among the least cost-effective providers of educational services.” The problem extends to what they call “curricular entropy”: offering endless specialized courses and concentrations “even when demand…dwindles.” The result is a sector of elite colleges that “already spend more than can be justified on educational grounds” (even as public schools’ strained finances jeopardize the quality of and access to education at the very places where most American are actually enrolled). Bacow explained the problem further in a 2016 essay and in April 2017, as Clark Kerr lecturer at Berkeley, where he addressed “The Political Economy of Cost Control on a University Campus.” Drawing on his leadership experiences, he detailed an ecosystem of interests aligned to drive education costs ever higher—at the risk, he fears, of derailing the entire sector. When costs are controlled, that is “almost always due to exogenous constraints on revenue.” He went so far as to say that access is no longer the most pressing issue for higher education—because escalating costs threaten to undercut public support generally, choking off government research and financial-aid funds. Faculty members value the artisanal, craftlike way their scholarship has developed, and resist administrative efficiencies that might yield benefits in the aggregate, but disrupt “locally optimized” systems of support that have reproduced all over campus. Even trustees, the financial fiduciaries, have countervailing incentives, Bacow said. Much as they care for their institutions, they are loath to see the schools’ reputations diminish on their watch. Hence, they are always inclined to favor new revenues—even when fundraising “can actually be quite expensive” if incremental resources do not fully cover an initiative’s costs. The path of least resistance is for tuition to increase. What, then, is to be done? Bacow nodded to the promise, if not yet the reality, of online technology. He also suggested lessening the competition that fuels rising costs—through shared scientific facilities, libraries, purchasing, graduate-student housing, and even the curriculum (a Lincoln Project recommendation): “We need not replicate” every degree program or research facility on every campus, he argued. Absent mandatory retirement, he even suggested experimenting with capping new tenured appointments at, say, 35 years, with the possibility of term extensions thereafter. Ultimately, he came back to the roles of leaders and their campus communities. Leaders need to do a better job of finding opportunities to lay out the real choices the institutions face: at some point, crises over costs that exceed the public’s threshold, and the collapse of government support. Again sounding the Tufts theme of collective responsibility for the community’s well-being, his takeaway was that acting to bend the cost curve is in the interest of every constituency within any college or university. At Tufts, he said, once financial aid became the highest undergraduate priority, he could have conversations about other wants: if students sought funds for three new club sports, he could frame that request in terms of the number of students who would have to be deprived of aid. In other words, having identified an overarching, intractable, even existential problem for higher education, Bacow concluded with his theory of action. Bacow arrived at Tufts as a distinguished scholar with recent administrative posts at MIT—but with limited knowledge about his new academic home. He assumed his Harvard presidency, by his own account, a couple of decades removed from professorial practice, but a veteran university leader and immersed in this one’s workings from his perspective on the Corporation. Even as he looked forward to “being a Harvard student again,” as he described his transition on February 11, Bacow knew that already being prepared (he was an Eagle Scout) would stand him in good stead. As one observer of his career put it, from Off Broadway (near the Tufts campus, on the Somerville-Medford line), he has now moved to Broadway (given the bright light shined so often on Harvard). Harvard’s sheer scale makes it more demanding to conduct the kind of personal presidency that he and Adele Fleet Bacow effected at Tufts. And the threatening external environment for higher education—a focal point for senior fellow William F. Lee’s remarks on February 11, and Bacow’s, too—suggests exceptional challenges for elite universities. It will be interesting to watch how Bacow allocates his energies between Washington, where Harvard has direct interests in the federal budget and regulation, and places the University touches only slightly now: metaphorically (and perhaps literally), Pontiac. Did he envision academic partnerships involving Boston’s flagship university (another subject he alluded to in February)? “Absolutely. Last week, [MIT president] Rafael Reif invited me to speak to the MIT Corporation—a bit like going home.” Already, Bacow said, he and Reif have charged their provosts with examining “existing collaborations, and there are many” (like edX, the Broad Institute for genomics research, an HIV/AIDS institute, and the graduate-level Harvard-MIT program in Health Sciences and Technology) to determine how they are working and how they could be improved, and “then to look in a systematic way at opportunities for us to collaborate in various scholarly initiatives.” Similarly with former MIT colleague Robert Brown, now presiding at BU: the two have “talked about ways in which we could collaborate, especially in Allston, which is closer to his campus than it is to ours.” And so on. • How to proceed. After a decade of expansionary University hopes reined in by financial crisis, little if any growth in the professoriate, governance reform, and the extensive Harvard Campaign to repair the balance sheet, Bacow arrives, as he did at Tufts, championing the faculty and the mission. There’s a frequent conversation one winds up having in jobs like this: it was true when I was chancellor of MIT, it was true when I was president of Tufts, and I am certain it will be true when I assume this office two weeks from today. That is, somebody will come in—it could be a dean, it could be a faculty member, it could be a vice president—and they will be either unhappy with a decision I have made or they will be asking me to do something that I cannot do. And what I have found very effective…is to listen and listen carefully…. My job is to make you a better dean, a better faculty member, to enhance your capacity to do your work, but in this case I can’t do what you’re asking me, because my responsibility is to the institution writ large. In my experience, when you explain things to people who truly care about the institution in those terms, they understand. How he defines those responsibilities will become clearer soon: Bacow’s installation is October 5. People keeping score should be able to tick off a clear focus on common purposes—and higher purposes (from February 11: “I can think of no more exciting time than [now for] doing all I can and indeed I would say—all we can—to help Harvard achieve [its] potential, not just for the good of our students, but for the good of the world that we aim to serve”). At least with their inner ear, they should detect a leader with a vigorous appetite for action, honed by scholarship and practice for nearly five decades.